BOCA DEL RÍO, Mexico (AP) - It's almost as if Letty Stegall is there, back home in the United States, beside her daughter to prod her awake for school. When her husband goes to the grocery store, she fusses over the list with him. At the bar she helped run, she still gives regulars a warm welcome, and around the dinner table at night, she beams when she sees what her family managed to cook. But Stegall's face only appears on a screen, and her words come in unreliable cell connections and a barrage of texts. Lives once lived together are divided by some 1,600 miles. A woman who married an American and gave birth to an American and who came to think of herself as American, too, is now deported to her native Mexico. "I wish I was there. That's all that I want," she says of her life in Kansas City, Missouri. "I want my family back." As the United States takes a harder line on immigration, thousands who called the country home are being forced to go. Often, they leave behind spouses and children with American citizenship and must figure out how to go on with families fractured apart. Studies have found an estimated 8 million to 9 million Americans - the majority of them children - live with at least one relative who is in the country illegally, and so each action to deport an immigrant is just as likely to entangle a citizen or legal U.S. resident. Stegall's deportation means she could be banned from the U.S. for a decade. She prays paperwork seeking to validate her return through her marriage could wind through the system within two years, but there is no guarantee. For now, she is a stranger in the vaguely familiar land she left as a 21-year-old in 1999, her phone and laptop the only windows to a life that's no longer hers. When her 17-year-old daughter, Jennifer Tadeo-Uscanga, arrives home from school, Stegall is there on FaceTime to greet her. She watches streaming feeds from 16 cameras at the bar she manages remotely. She gives Steve Stegall, her husband of six years, a goodnight kiss by pressing her lips to her cellphone screen. The four-dimensional, analog world she loved has been flattened and digitized. She recognizes how odd it all may seem, but she wonders what other choice she has. Should she pull Jennifer from the only country she's ever known, where her dreams of college and career seem so achievable? 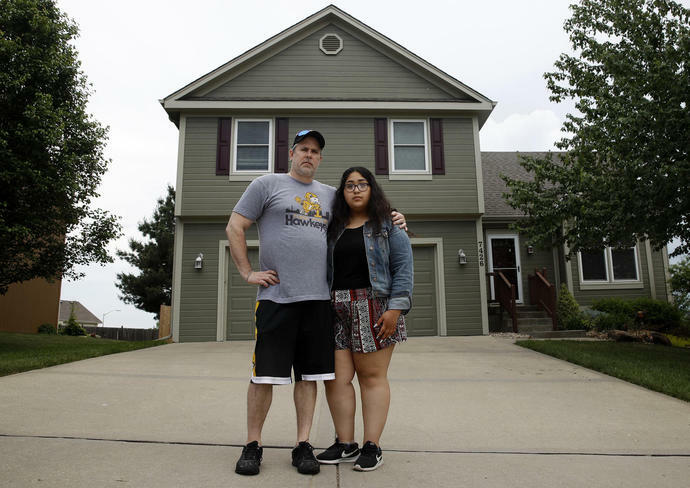 Should she ask Steve - born and bred in Kansas City - to abandon their business and home and come to a place where he can't speak the language and his safety might be jeopardized by drug cartels? "I lost everything," she says. "It's just me." Stegall grew up two hours from here in Cosamaloapan, a flat, crop-dotted part of Veracruz, the state that hugs a broad chunk of Mexico's eastern coast. Her parents' furniture business afforded a comfortable existence, but drawn by the stories of a cousin who settled in Overland Park, Kansas, Stegall was convinced there was greater opportunity for her in the U.S. She paid a smuggler $3,000 to lead her across the Rio Grande. She got married and had Jennifer, but later divorced. Then she fell in love with Steve, who came to see Jennifer as his own. Stegall mastered the language and watched her paychecks grow. She and Steve bought a home, and soon Stegall became the heart of The Blue Line , the bar they ran together. When the Olympics aired, she'd drape herself in red, white and blue, and when the national anthem sounded, she'd nudge her husband to remove his hat as she stood solemnly, goose bumps covering her body. All the while, her parents told of kidnappings and decapitations back in Cosamaloapan, of the cartel taking over and the family being forced out. They deserted their home and business, and fled for Boca del Río. She thanked God she had escaped. She didn't think she'd ever return. In Kansas City, the fear of being caught that Stegall had when she first arrived receded with each passing year. Donald Trump's campaign and his tough rhetoric on illegal immigration piqued her attention and stirred a little worry, but he talked about catching rapists and murderers and gang members, and that wasn't her. She carried her Social Security card, obtained through her marriage, work permit and driver's license everywhere just in case. "I'm married to an American citizen," she pleaded. "I have a citizen daughter." She wonders why the government's crackdown efforts seem to focus on her and other low-level criminals instead of the "bad hombres" that Trump said he'd banish. Don't her daughter and husband have a right to keep their family intact? Don't her years of paying taxes, of learning English, of living an otherwise pristine life count for anything? "They didn't take out the people who are dangerous," says Stegall, 41. "The murderers are still there. The gangsters are still there. The rapists are still there." Officially, Stegall's deportation process began under President Barack Obama. He became known as the "deporter in chief" for presiding over so many removals but changed tactics in the final two years of his presidency, when ICE was directed to exercise discretion to defer action on certain migrants with standing removal orders, including those with citizen children and living in the U.S. prior to 2010. A DUI arrest was generally seen as "a midlevel priority," says Randy Capps, an expert on deportation at the Migration Policy Institute , and people like Stegall often were allowed to stay in the latter part of Obama's presidency if they had regular check-ins with ICE, paid processing fees, were fingerprinted and stayed out of trouble. An executive order issued by Trump changed that, effectively declaring any immigrant without legal status subject to arrest. Even the path once seen as simplest to legal status - a legitimate marriage to a citizen - no longer is always enough to stave off deportation. Stegall didn't apply for a green card after getting married because her former attorney told her she had little to worry about with a citizen husband and daughter and because, under U.S. law, she likely would have had to return to Mexico and wait out the process there. Four days after her February arrest, Stegall won a stay of deportation in court pending a hearing. But ICE already had her shackled aboard a flight to Brownsville, Texas, where she was directed to cross by foot back into Mexico. Her family, relieved by the victory in court, didn't even know she was gone. "The new normal, really, is rush and push people out of the country, regardless of what's going on," says Stegall's current attorney, Rekha Sharma-Crawford. "She's not dead," Jennifer, a native of the Kansas City area, says of her mother. "But she's not here." Stegall's husband is depressed and has taken to clutching a pink teddy bear in bed, when he's not hustling to maintain their business. Stegall's in-laws, who built lives in Kansas City like their parents before them, have put off retiring to their lake house because they're needed at the bar to fill in for the woman they consider a daughter. When Jennifer's birthday came, just after Stegall was deported, the teen got her favorite dish of fettuccine alfredo at Olive Garden and the Versace perfume she wanted as a present. Her mom appeared on FaceTime to sing "Happy Birthday," but it wasn't enough to soothe the sadness. Each momentous occasion that awaits Jennifer - senior year, Christmas, graduation, college - is tainted because the person closest to her won't be there to share in them. "My God," Jennifer wrote to the immigration judge handling her mother's case, "my own country has been the one that has caused me pain." Before Stegall's deportation, her lawyer argued Jennifer was suffering depression and anxiety, wrought with fear her mother would be taken from her. Steve counts the moment he had to tell Jennifer that ICE had picked up her mother as the worst of his life. They bawled as the teen buried her face in her stepfather's shoulder. "We were best friends," he says. "When somebody gets yanked away from you one day, it's just a huge hole in your life. You don't have her to come home to ... just seeing her around the house, hearing her laughing, you know? Watching her smile." At The Blue Line, where the ceiling is hammered tin and the walls are covered in hockey skates, jerseys and sticks, the bartender this night is wearing a white T-shirt that says "#BringLettyHome" and a flag-festooned box at the end of the bar is labeled "Letters for Letty." "Life here is incomplete without you," reads one. "A couple tacos and a few drinks at happy hour isn't the same without your smile," says another. "You don't know me but I was sick when I heard your story," goes a third. Jennifer Rice, a waitress who has taken over some supervisory duties, struggles to capture all that Stegall's absence means. Customers ask about her daily. Her long list of responsibilities has shifted. The friend so many came to count on has been taken away. "All of a sudden, she's gone," Rice says. "You just can't put it into words." A moment later, she can't help herself, and she's dialing Stegall. "I miss you and when I talk about you, I get upset. It makes me emotional," Rice says as she begins to cry. "I love you so much." Back in Mexico, Stegall takes her glasses off to wipe tears away. Many in the bar this night, including Steve's parents, gave their vote to Trump. They liked his promise to bring jobs back to the U.S. and the vow to make trade with China fairer. And they supported him when he said criminal immigrants would be deported. They just didn't consider Stegall one, even if she came to the country illegally. "I've always been proud to be an American," says Shirley Stegall, Steve's mom. "But now I'm ashamed." Jerry Rosetti, sipping scotch and water near the box of letters to Stegall, doesn't think she should have been targeted and calls the situation "a raw deal." But he still supports the president and still thinks illegal immigration is wrong. "I would trade places with her in a minute," he says. "She shouldn't be in Mexico. She should be right here, right now." The dichotomy angers Steve. When someone balances compassion for his wife with support for Trump, he's confounded. "He's destroying American lives," Steve says of the president. "How can you do this? How can you do this to your own American people?" Time plays funny tricks. Stegall remembers those early days in Kansas City, when the winter cold seemed unbearable, the numbers on thermometers and price tags so foreign, the food off-putting. She struggled to communicate, repeatedly chided with a similar refrain: "This is America. Speak English." Now she misses the seasonal shifts, it's Celsius and pesos she can't seem to grasp, it's the American adaptations of Mexican food that she craves - and those American souls she wants to surround herself with. She sometimes finds herself struggling for a word or slipping into a Spanglish hybrid. "Tía, estás en Mexico," a nephew interjects. "Auntie, you're in Mexico." She returns to the house in Boca del Río, the one she shares with eight others, after her afternoon routine. And as night draws closer, the computer before her glows. She's watching the bar again, spotting friends, questioning why a customer hasn't gotten his food, noting when a light indicates a phone call is coming in but not being answered. "I wish I could go inside my laptop," she says. "An hour is a month. A month is a year," she says. Midnight nears and she has crawled into bed in a small room she took from her nephew, with walls of cement and a big mirror rimmed with family photographs. She's lying down, wearing a black Coors Light tee and leopard-print pajama pants, when her daughter's FaceTime call comes in. They talk about dinner and share gossip about an acquaintance's impending marriage. They end as they always do, with a string of prayers and "I love yous." She and Steve trade texts about whether to watch Netflix together but apart, before deciding they're too tired for a show. They go through the banality of their days, joke about losing weight and recount his visit to a psychiatrist before holding their lips to the screen to say goodnight. She steals a last look at the bar's cameras, where the crowd is thinning. She's too tired to keep watching, so she closes the screen and slips off to sleep. In her dreams this night, she's back in her house in Kansas City, with her soaring cathedral ceilings and the stainless steel refrigerator covered in magnets. Her dogs, Blue and Bella, are just back from doggy day care, and one of Blue's back legs is injured. Jennifer is angry, having told her mother not to send the dogs there. Her husband is bickering with her over something she won't be able to remember the next day. Read more of AP's coverage of the reverberations of the Trump administration's policies on immigration here . Lea la historia en español aquí.